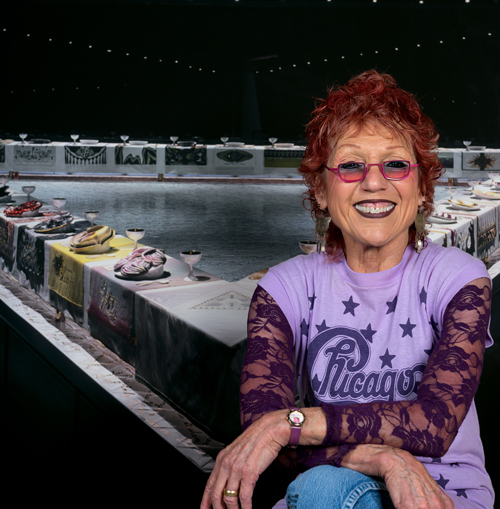 CHICAGO—The School of the Art Institute of Chicago (SAIC), a global leader in art and design education, will welcome celebrated artist Judy Chicago to deliver the School’s commencement address on Monday, May 14, at Wintrust Arena, 200 East Cermak Road. Chicago, who was recently named one of Time’s 100 Most Influential People of 2018, will receive an honorary doctorate from the School, along with esteemed honorees, iconic Peruvian artist and SAIC alum Teresa Burga, critically acclaimed artist and SAIC alum Rashid Johnson, and renowned architect Stanley Tigerman. Since 1938 SAIC has awarded honorary degrees to an elite group of individuals who have made significant contributions to art, design, scholarship and culture. Past recipients include Marina Abramovic, Tania Bruguera, Jeanne Gang, Theaster Gates, Jeff Koons, Kerry James Marshall, Albert Oehlen, Yoko Ono, David Sedaris, Patti Smith, and Kanye West. “The School of the Art Institute of Chicago is honored to welcome Judy Chicago, Stanley Tigerman, Rashid Johnson, and Teresa Burga into the class of 2018,” said Elissa Tenny, president of SAIC. “Through their work and scholarship, these citizen artists address contemporary issues and exemplify the values that make SAIC a school of art and design that is distinct from any other." More than 900 students are expected to receive undergraduate and graduate degrees and post-baccalaureate certificates from the prestigious art and design institution. Teresa Burga (MFA 1970) is a Peruvian multimedia artist whose pop-art inflected, research-intensive works have put her on the forefront of conceptual and experimental practices. A founding member of the Grupo Arte Nuevo, a Peruvian avant-garde movement that lasted from 1966–68, Burga was instrumental in introducing pop art, op art, and happenings to the Peruvian art scene. For her seminal work Perfil de la mujer Peruana (Profile of the Peruvian Woman) from 1981, she collaborated with psychotherapist Marie-France Cathelat to create a multimedia installation and publication based on data collected from surveys and research about the lives of Peruvian women. Judy Chicago (commencement speaker) is an artist, author of 14 books, educator, and humanist whose work and life are models for an enlarged definition of art, an expanded role for the artist, and women’s right to freedom of expression. Chicago is most well-known for her role in creating a feminist art and art education program in California during the early 1970s, and for her monumental work The Dinner Party, executed between 1974–79, which is now the centerpiece of the Elizabeth A. Sackler Center for Feminist Art at the Brooklyn Museum in New York. Over the subsequent decades, Chicago has approached a variety of subjects in a range of media, including the Birth Project, PowerPlay, the Holocaust Project: From Darkness into Light, and Resolutions: A Stitch in Time. Chicago’s work has been exhibited widely in the United States and internationally and her continued influence has, in recent years, been increasingly acknowledged. Rashid Johnson (SAIC 2003–04) is among an influential cadre of contemporary American artists whose work employs a wide range of media to explore themes of art history, individual and shared cultural identities, personal narratives, literature, philosophy, materiality, and critical history. After studying in the Photography department at SAIC, Johnson's practice quickly expanded to include sculpture, painting, drawing, filmmaking, and installation, yielding a complex multidisciplinary practice that incorporates diverse materials rich with symbolism and personal history. Johnson's work is known for its narrative and embedding of a pointed range of everyday materials and objects, often associated with his childhood and frequently referencing collective aspects of African American intellectual history and cultural identity. To date, Johnson has incorporated elements as diverse as CB radios, shea butter, literature, record covers, gilded rocks, black soap, and tropical plants. Many of Johnson’s works convey rhythms of the occult and mystic: evoking his desire to transform and expand each included object's field of association in the process of reception. Stanley Tigerman is a principal in the Chicago architectural and design firm of Tigerman McCurry Architects and a Fellow of the American Institute of Architects (AIA) as well as the Society of Architectural Historians. He received both of his architectural degrees from Yale University. Of the more than 400 projects defining his career, 185 built works embrace virtually every building type. Designing projects throughout North America, Europe, and Asia, he is the recipient of design awards from the AIA, AIA Chicago, and AIA Illinois, as well as Architectural Record’s Houses and Interiors awards and the Progressive Architecture Design Awards. Tigerman was selected as one of the architects to represent the United States at the 1976, 1980, and 2012 Venice Architecture Biennales as well as the 2015 and 2017 Chicago Architectural Biennials. In addition to being an author, lecturer, and visiting chaired professor at numerous universities, including Yale University and Harvard University, Tigerman was resident architect at the American Academy of Rome, director of the School of Architecture at the University of Illinois at Chicago for eight years, and he cofounded Archeworks, a socially orientated design laboratory and school. Tigerman was a founding member of the “Chicago Seven” architects as well as the Chicago Architectural Club and received Yale University’s first Alumni Arts Award. He also received the Illinois Academy of Fine Arts Award and was the recipient of the American Jewish Committee’s Cultural Achievement Award. The International Union of Bricklayers and Allied Craftworkers honored Tigerman with the Louis Sullivan Award, and he received the Topaz Medallion for Excellence in Architectural Education and the AIA Illinois Gold Medal in recognition of outstanding lifetime service. The Architecture and Design Society of the Art Institute of Chicago honored Tigerman’s lifetime achievements at the 2012 Modern Ball and AIA Chicago bestowed the Lifetime Achievement Award on Tigerman in 2013. Tigerman is the author of six books and editor of eight with the latest being his autobiography, Designing Bridges to Burn.